The Mopan River is located in the Cayo district of Belize, close to the border of Guatemala. The river mingles with the Belize River whereas the waterway joins up with the Macal River on the other side. The Mopan River is considered as quite a significant water body, as it remains to be a good source of drinking water and other domestic works for the people of the area. Owing to its mild whitewaters, the river stands out as a major rafting destination for all beginners. The Mopan River offers relatively shorter waves, as it runs through the Xanantunich Maya ruins. While on a rafting voyage during the dry season, the river will welcome you with mild rapids and fascinating waterfalls. Best suited for family trips and novice rafters, the Mopan River, with its tranquil waters, offers great amount of excitement and fun! If you are good at swimming, you can even dive into the mild waters of the river. During the rainy season, the scenario is however a bit different. As the sky adds volume to the Mopan River, the rapids become a bit tumultuous, providing you with high-rising whitewaters and foaming waves you had ever dreamt of! By the river side, you can catch a glimpse of the passing iguanas and other exotic animals. Additionally, you get to watch the colorful birds perching on the riverside trees. Belize, with its rich natural splendor, welcomes every rafting enthusiast with open arms. 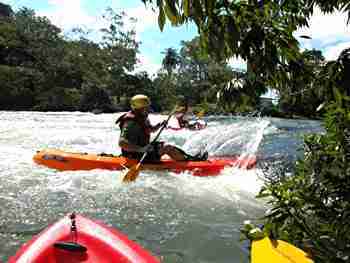 Coupled with the lush greenery by the riverside, comes enough scope of exhilarating whitewater adventure. So, grab all the fun and set off to embark on a memorable trip down the Mopan River!